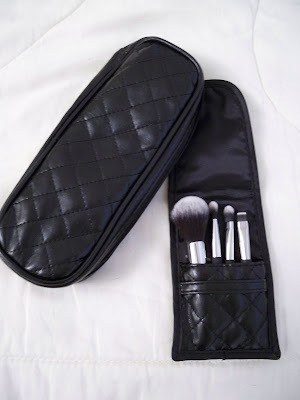 It comes with eight full sized brushes, a black quilted brush roll, an eyelash curler, and a mini four piece brush set with a tiny roll to travel with, or in my case, to keep in my purse! I've decided to share with you girls my favorite brushes from the collection: Sorry for the appearance, they are a bit dirty at the moment from using them this morning! The HUGE fluffy powder brush is so soft! 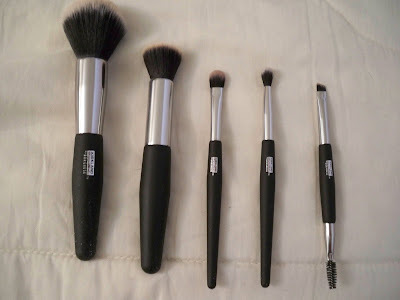 All of these brushes are super soft, much softer than any of my EcoTools, Essence of Beauty, and even my MAC brushes! The powder brush is perfect for applying...well, powder of course! I use it to set my makeup. I could touch it to my face all day long, it feels so nice and soothing! The flat top brush is great for contouring and applying bronzer. The flat eyeshadow brush reminds me very much of MAC's 239 brush, which I have always wanted to own. Not so after this kit! Similarly, the crease brush is THE PERFECT crease brush for my small lid space. I find a lot of crease brushes to be too fluffy, but the one here is small enough to be precise. It fits right into the creases of my eyes. Lastly, the double ended angled brush with spoolie works for taming my brows, as well as applying gel eyeliner. The angled brush is just a bit strange. It is very flat. I guess I could use it to apply a powder highlight to my cheekbones, but I never find myself reaching for this brush. It feels kind of flimsy to me. The sponge tip applicator is a waste in my opinion. I would have much rather prefered an actual smudger brush, like MAC's 219 instead. The sponge tip is a total filler item in this (almost) perfect set. I also want to mention the brush bag and the mini set of baby brushes. The bag is really nice, and I am currently using it to store old brushes that I have no use for at the moment. Brushes of all sizes fit nicely into it. This will come in handy when I travel. The mini brushes I keep in my makeup bag are sort of flimsy, but they are perfect for mid-day touch ups . * Great value for everything you get. Just one MAC brush costs more than twenty dollars, and in this kit you get eight! * The quality of the brushes is amazing. They are so soft and well-made! I have not noticed any shedding whatsoever with any of them. I want to mention that these are synthetic. They are not skunk brushes. The tips of them are just dyed white. * The handles are sturdy and the black makes them look very chic. * I just don't particularly care for the two brushes that I mentioned. But...that is my only con! If you are in the market for affordable, yet well-made brushes, then definitely go to your nearest Costco and at least check them out! I reach for these now more than any of my other brushes, and I am so happy with them. 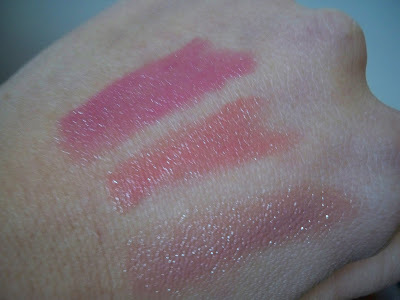 In other random news, I got a few requests in my last haul to post swatches of my new lipsticks as well as the Sephora by OPI nail polish in Nonfat Soy Half Caff. And here is a NOTD featuring the polish. I must say, I am not thrilled with the color. I thought it looked much more beautiful in the bottle. On my nails, it just looks a bit orange. Plus, I needed three coats just to get any semblance of actual color. I might return it, since Sephora is so lenient on their return policy. What do you girls think? Be honest! Wow, that was a long post! I hope my review was helpful. If you guys have any further questions, please feel free to ask! And let me know what you think about the polish! 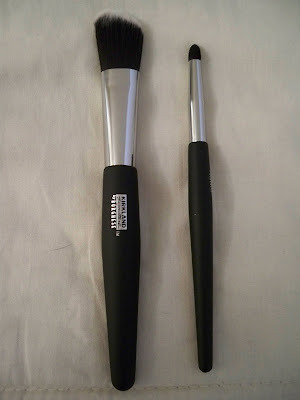 I have heard a lot about these brushes, I dont think we can get them in the UK though :( I agree though, sometimes cheap brushes are just as good, if not better, than the expensive brands! I feel the same way with the brushes you dont care for. I hate the sponge tip brush. Its useless and the foundation brush is just okay. Thanks for the awesome review, I too have small creases and I need smaller brushes! Wow this is an amazing price. Brushes are always investments, it would nice to get a variety at a decent price to see which ones I like and use most! I finally got this set of brushes after NOT getting all the previous years' sets. I have to agree, these brushes are soo soft and were very worth it. @Lisa: So happy you enjoy them as much I do! @ Post grad: Yes, it just goes to show that inexpensive doesn't mean a compromise in quality. A good brush plays a vital role in make up! I absolutely loved your review, keep up doing that fantastic work! I like your blog so much! I'm really hoping that Costco still has those brushes when I get near one again. I don't really see orange in that nail colour, but it could just be my computer screen. However having to do three coats is my absolute pet peeve with nail polish. . . I have ones that I wish I had returned because of this. I generally love everything Kirkland makes. They really are quality items! 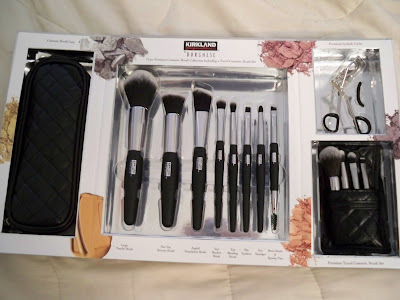 I never even knew they made makeup brushes but will have to keep my eye out at Costco! Great post!! !